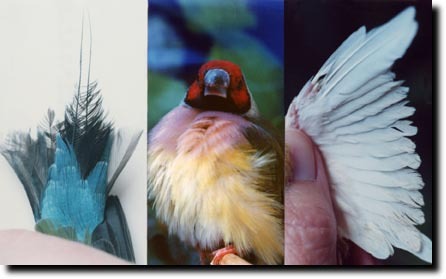 Inspect your bird for signs of feather mite damage. Mites/lice aren't common in companion birds but when they occur, they're cause for concern. 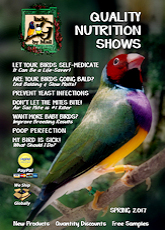 If a bird does have a problem with mites or lice, in most cases, the critters only live on the bird and don't bite humans or other pets – and are easy to eradicate! Lice are very common and widespread as far as parasites are concerned. Lice are placed into two groups: Biting lice and sucking lice. Birds are only parasitized by biting lice. These parasites don't actually bite the bird or host, but they do have well-equipped mouth parts for chewing and eating bits and pieces of skin and feathers. All lice are small, fast-moving wingless insects. The entire life cycle of the lice is spent entirely on the bird. 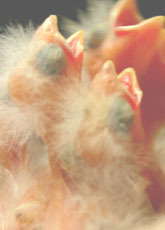 The eggs are laid in clusters along the shaft of the feathers. These egg clusters are referred to as nits, and hatch within a few days, producing nymphs. Nymphs are young immature lice. The nymphs then go through changes and later become larvae, which go through several more changes before they finally become mature adult lice. Adult lice can live for several months on the host, but they can only live for a few days away from or off their bird host. Transmission of lice to birds is by direct body contact from one bird to another. Transmission is most prevalent when birds are huddling together during cold weather month, during mating, brooding nestlings, and perching closely to infested birds. Red mites can be found on any species of bird. They feed at night, which often makes the bird restless and itchy. It's not always easy to spot an infestation. Like lice excessive preening, ruffling of the feathers and feather damage are sign that indicate the bird has mites. The mites are found crawling around on the skin or feathers at night. The easiest way to diagnose them is by covering the cage at night with a white sheet. Examination of the sheet in the morning will show tiny brown or red specks about the size of a grain of pepper if the bird has red mites. After they take a blood meal from the bird, they will crawl off into cracks in the cage, perches, nest boxes or even into other areas of the home in the morning. Signs of lice/mites infestation include restlessness, excessive preening ruffling of feathers, and signs of irritation. Sometimes the plumage and feathers don't even appear to be damaged by the lice, even in very severe infestations. But in some cases, evidence of feather damage by lice is quite evident. Diagnosis of a lice infestation is based upon visual examination. The region of the head and vent are most frequently attacked by these parasites. Treatment for lice and mites includes enforcing proper sanitary and hygiene measures, disinfecting and cleaning cages, perches and nest boxes. We offer four excellent products, Avian Insect Liquidator, Control, and S76 to control a wide range of insect pests including flies, lice, ants, cockroaches as well as arachnids such as spiders and mites. The beauty of these products are that they can be safely and effectively applied to birds, cages and their environment at any stage of the breeding cycle and at any stage of the insects lifecycle. 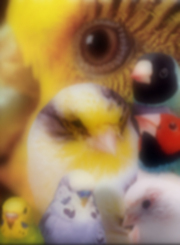 They come in ready to use and concentrate sizes for larger flights, aviaries and bird rooms. While effectively controlling insects, they will not cause harm to the health and fertility of mature birds, fledglings, or eggs. They are all extremely safe but effective. Choose the one that works best for your birds. If you have lots of birds making it almost impossible to catch then S76 is for you. 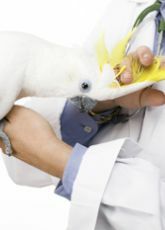 Mix S76 at drinking water strength (1/2 teaspoon per liter of water) for your bird’s bath water. This should be followed up several days later with a KD Water Cleanser bath. This second bathing/misting will remove all the dead mites and help promote lustrous clean feathering. Remember to treat all new arrivals and to re-treat any bird that has been out of the aviary and in contact with other birds.